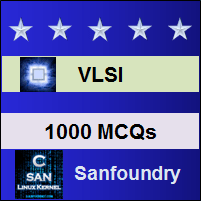 This set of VLSI Multiple Choice Questions & Answers (MCQs) focuses on “Noise in MOS Devices”. Explanation: In VLSI circuits noise limits the minimum signal level that a circuit process with acceptable quality. Explanation: Noise is a Random Process. Explanation: Noise generated by independent devices are uncorrelated, eg: noise generated from resistor is not similar to noise generated from transistor. Explanation: Device electronic noise and environmental noise affects signal processing of analog signals. Explanation: Thermal noise is due to random motion of electrons in a conductor. 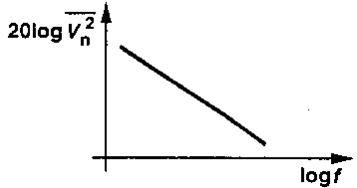 Explanation: Thermal noise is generated due to conduction of charge carriers in the channel. Explanation: The interface between Gate oxide and silicon substrate generates flicker noise. Explanation: Dangling bonds generate flicker noise. Explanation: Depending on the Cleanness of oxide silicon interface flicker noise varies. Explanation: Logic output 1 from first gate is considered as logic input 1 at second gate as it lies within the range.